Acting EPA Administrator Andrew Wheeler, at the Shale Insight Conference in Pittsburgh. At an oil and gas conference in Pittsburgh Wednesday, Acting EPA Administrator Andrew Wheeler touted the Trump administration’s moves to roll back over 70 environmental regulations, telling the crowd the rollbacks will make America’s air and water cleaner while keeping the economy booming. In a bullet-point laden speech before the Shale Insight conference, Wheeler reeled off a list of EPA initiatives to cut down on regulations on the coal and oil and gas industries, and recited data showing an improving environmental picture in the U.S. He touted a recent report showing American greenhouse gas emissions fell by nearly 3 percent in 2017, President Trump’s first year in office. “The Trump administration has proven that federal regulations are not necessary to drive greenhouse gas reductions,” Wheeler said. Experts say the reductions have more to do with a long-standing transition away from coal to natural gas and renewables in the power sector, than any Trump administration actions. Power sector emissions dropped 4.5 percent in 2017, according to the EPA data. “The drop there is largely because of (the) continued switch from coal to gas and various federal and state incentives or requirements for more wind and solar power,” said John Reilly, co-director of the MIT Joint Program on the Science and Policy of Global Change, in an email. “Old coal plants are closing or being dispatched less because they cannot compete with these sources.” Improving automobile efficiency, spurred by federal fuel efficiency standards, is also part of the drop, Reilly said. Wheeler said the agency would try to help the oil and gas industry by studying re-use of oil and gas wastewater, reduce times for EPA enforcement decisions, and increase communication between the agency and state and tribal environmental agencies. He praised the natural gas industry, which has greatly increased its output thanks to improvements in extraction techniques, like fracking. “You have been at the forefront of technological advances that has transformed our economy, our national security and our environment,” Wheeler told the audience of oil and gas executives. The EPA is rolling back over 70 environmental regulations, including rules that would curb the release of climate-damaging methane from the oil and gas industry. Wheeler said that 28 rollbacks had already saved American companies $1.6 billion in reduced regulatory costs. “We can create jobs and keep the economy booming” while also reducing pollution, Wheeler said. Wheeler defended the EPA’s decision under Trump to replace the Clean Power Plan, an Obama-era rule to reduce climate-warming carbon dioxide pollution from the electric sector, with the weaker Accelerating Clean Energy rule. “The ACE rule would encourage new investments so that coal can continue to be part of a cleaner future,” he said. He said that since other countries will continue to burn coal, the U.S. should continue to promote its use so that it can export “clean coal” technologies, though he did not specify what those technologies are. “Clean coal” is a catch-all term that can mean carbon capture and sequestration, emissions scrubbing technology, or alternative use of coal for purposes other than combustion. Wheeler said the agency would continue its push against “secret science” by only basing decisions on scientific studies for which underlying data is publicly available. Public health scientists worry this initiative could exclude epidemiological studies that rely on confidential patient data. “Americans deserve to know the science that’s guiding EPA’s decisions that impact their lives, especially when it is funded with taxpayer dollars,” Wheeler said. 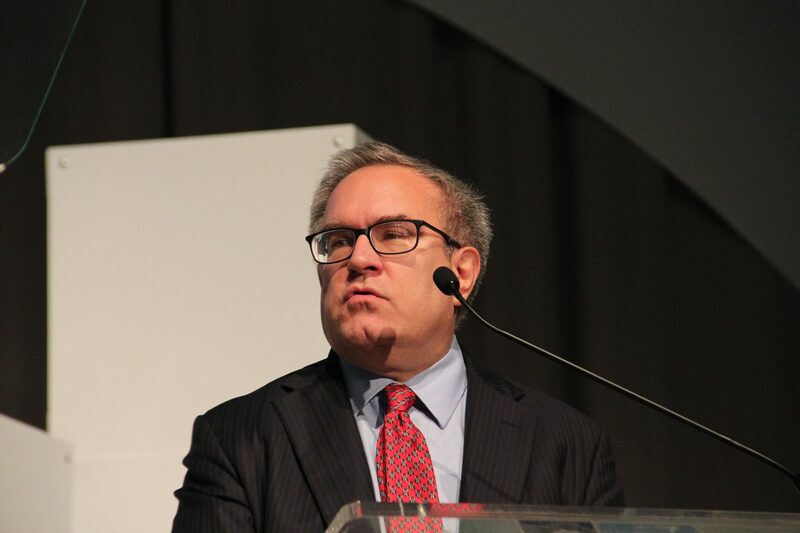 Environmental groups criticized Wheeler’s visit to Pittsburgh. David Doniger, senior strategic director of the Natural Resources Defense Council’s Climate and Clean Energy Program, said the EPA’s current deregulatory approach will reverse environmental gains made in recent years. “The pollution control rollbacks that Andy Wheeler is pursuing will make carbon pollution — climate pollution from our cars and our power plants — go up, not down,” compared to where they were headed under Obama-era rules, he said. “It exposes communities across the country to harmful and preventable air pollution and exacerbates climate change,” Minott said, in an email. People representing environmental groups and tribal members, as well Pittsburgh mayor Bill Peduto, rallied outside the conference Wednesday afternoon. Speakers railed against the ethane cracker plant Shell is building in nearby Beaver County, and stressed the need to protect water. Standing alongside the Allegheny River, a tributary of the Ohio River, Sharon Day spoke about her experience walking the length of the Ohio in 2015. As Peduto touted Pittsburgh’s recent environmental accomplishments, including imposing a ban on fracking within city limits, several in the crowd urged him to address Shell’s Beaver County cracker plant. Some environmentalists have been critical of Peduto for not taking a stronger stance against the facility, which will use ethane gas to make ethylene for manufacturing plastics. When the plant is finished, it is expected to be one of the region’s biggest polluters of smog-forming chemicals. StateImpact Pennsylvania reporter Amy Sisk contributed to this story.